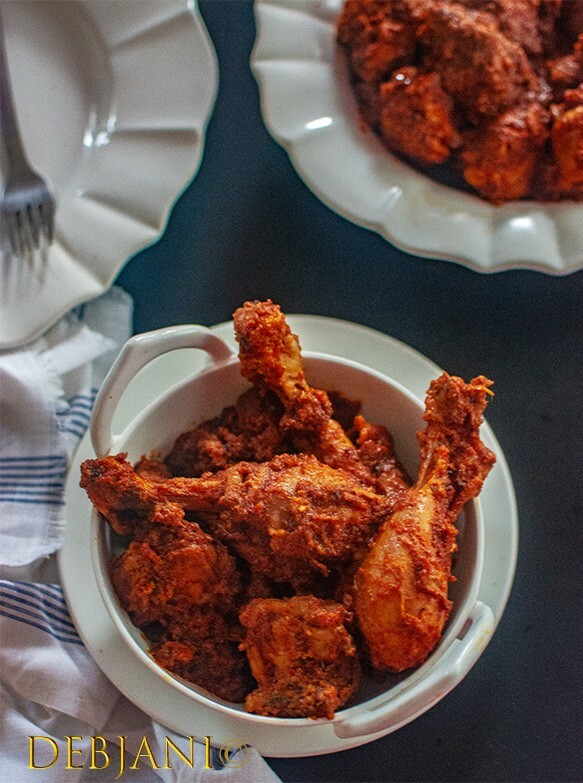 Kolhapuri Chicken is a spicy and tangy Chicken side, I make quite often at home, whenever I crave for the taste of coconut in my chicken gravy. Chicken Kolhapuri is certainly one of the famous dishes from the state of Maharashtra. This Chicken Curry is characterized by the red-hot color and above all the spicy taste and texture. Mutton Kolhapuri or Kolhapuri Egg or Veg Kolhapuri apart from Kolhapuri Chicken are equally famous. A city from Maharashtra; Kolhapur is the headquarter of Kolhapur district as well. The city is famous for the religious account as well as was one of the princely state ruled by Bhosle Chatrapati. As far as mythological detail goes, the city got the name from demon Kolhasur. 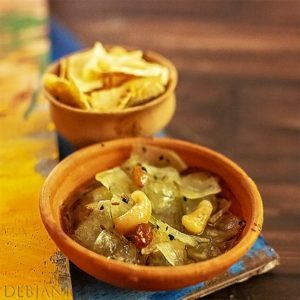 The cuisine is rich and several items are named by the city itself which include Kolhapuri Chilli, Kolhapuri Spice or Masala, Kolhapuri Gur (Jaggery) and even Kolhapuri Vail. You may please refer to Wikipedia for further details. Kolhapuri Chicken is a famous tangy Chicken side dish from the state of Maharastra and to be specific from Kolhapur. This dish or any Kolhapuri dish is characterized by the use of Kolhapuri spice mix or Kolhapuri Masala. This dish, however, is perfect for those who can handle spices gracefully. I often prepare Kolhapuri chicken for small family gatherings. I love the tangy taste of the spices and the typical aroma of roasted Coconut in the gravy of Kolhapuri Chicken. Moreover, the recipe actually is quite easy. To make the Kolhapuri Masala you need a few spices along with grated coconut or desiccated coconut. The spice mix is prepared by grinding everything together. Some people prefer to use Kolhapuri Chutney while making the spice paste which is, however, not available in Kolkata. Yogurt or curd is optional however, I use it to tenderize the chicken, Moreover, it gives an amazing flavor to the dish. 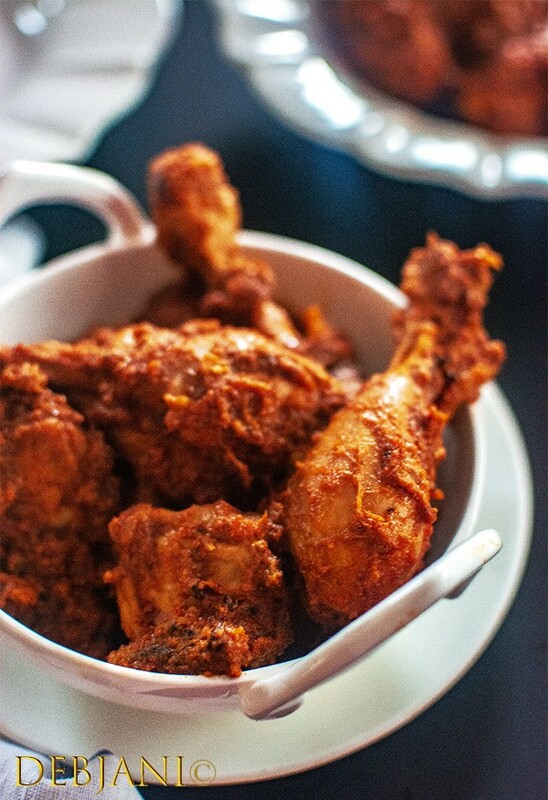 Kolhapuri Chicken or any Kolhapuri dish is characterized by the use of Kolhapuri spice mix or Kolhapuri Masala. This dish, however, is perfect for those who can handle spices gracefully. Crushed black pepper: ½ Tsp. Prepare marinade with turmeric powder, red chilies, garlic paste, salt and lime juice and curd and add chicken pieces to the marinade and leave it for 1.5 hours. I prefer to marinate the chicken overnight. Dry roast bay leaf, cinnamon, cloves, crushed black pepper, poppy seed, sesame seed and grated coconut. Sauté till nutty aroma comes out. Now heat 1 Tbsp. of Oil and fry chopped onion till those turn crispy. Now add chopped tomatoes to the mixture and cook it for 10 minutes in medium flame till oil separates out from the mixture. Cool the mixture and make a paste after adding the dry roasted spices. 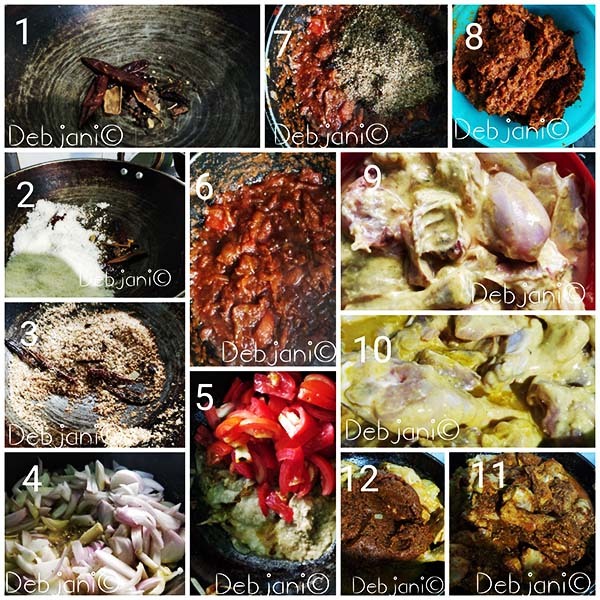 Heat oil in a pan and add marinated chicken to the pan and cook it on low flame for 30 minutes with regular stirring. Add Kolhapur Masala and mix properly. Cook for 8-10 minutes in low flame. You can garnish it with coriander leaves and can serve it with steamed rice. If available, use Kolhapuri chutney while making the spice paste. Yogurt or curd is completely optional, however, it helps in tenderizing the chicken. it also enhances the flavor. This dish calls for an overdose of chili, however, you need to adjust the hotness as per your requirements. I use vegetable oil. You can use mustard oil as well. Adjust the gravy based on requirements. Have you tried the Kolhapuri Chicken from Debjanir Rannaghar!